i made a concept for a multi touch tabletop computer to support small group design meetings. What do you think of my ideas? especially the “Resting Hand Gesture”. As for the concept, it looks good. The Resting Hand Gesture is an interesting one. Assuming all 5 fingers went down, you’d have to simply run a loop to see if something like the area formed was small enough by the 5 touch points to be a pre-determined amount. Ive coded in flash a loop for 3 fingers and it works quite well, so your idea would be good, though you may want to make it only need 3 fingers or so, as getting 5 nice blobs may be difficult. Who knows though! That’s what testing is all about. The ideas of interactive office environment objects and tasks was what started visual windows, so why not the world of multi-touch getting a boost from the editable and interactive environment of the office/meeting. Love the design, I think its a great idea. The problem is with the “Resting Hand Gesture” that I ran into, is when your using an application that sometimes requires your fingers to remain in 1 spot for a moment then the menu will pop up which would disrupt the application. If you made it so the menu only pops up at certain times or in a specific application then that would be great. I do love the idea though good job! Wow! thank you both for your quick and nice replies! -may i copy them to my page (http://dominickennedy.de/ba) for my profs. to see? Very impressive UI...would love to see it built. Here’s what jumped out at me the most, actually: the presence of non-finger objects on the table, both to serve a purpose and those just lying there. I think that really emphasizes the idea the MT can be integrated anywhere - office, school, wherever. The business cards, the coffee, the barcode thing...all make the setup seem truly integrated. I love the fact that in the video, around the 0:40 point, the users aren’t treating the table like its an extra - its a part of what they’re doing. I love the fact that in the video, around the 0:40 point, the users aren’t treating the table like its an extra - its a part of what they’re doing. Totally agree. I really think an important part of multitouch is going to be the ease at which it becomes another part of our everyday lives. When it becomes a less intuitive interaction with our machines, where the fact that your table, wall, etc has multitouch abilities and we just “use” it for everyday interactions, just like we use the mouse and keyboard, I think multitouch will have achieved it’s due place in the world of interaction between man and machine. Cant wait to see more. And of course you can quote me, right about me, etc. There is lots of good stuff around these forums, and read up on the wiki too. I saw your vimeo video the other day CinimoD and thought it was nice. Would you consider the ‘resting hand’ as a ‘finger hold’? Wow nice video and very interesting concept. I share Microsofts view in that order for this technology to progress and disseminate to a wider audience you have to start commericially and with business. Its refreshing to see a business based concept, the coffee thing probably goes too far but very cool nevertheless Kind of wish this was an actual app Id buy it tomorrow and just sit around pulling up documents and slapping digital paperclips on them great work. I think your concept would be quite easily doable if you would use a front projection (from the ceiling). Has anyone on the boards actually done this Sandor? Simple stunning work man! keep up the great work and look forward to seeing more! The Resting Hand Gesture is an interesting one. Assuming all 5 fingers went down, you’d have to simply run a loop to see if something like the area formed was small enough by the 5 touch points to be a pre-determined amount. Ive coded in flash a loop for 3 fingers and it works quite well, so your idea would be good, though you may want to make it only need 3 fingers or so, as getting 5 nice blobs may be difficult. Who knows though! That’s what testing is all about.
) could be helpful - it would also help to get the orientation for the menu buttons that grow from the user’s fingers. wow, Great prototyping skills ! i really like this coffee thing, it’s surely one of the next use of mt setups = an interface to interact with the real world . 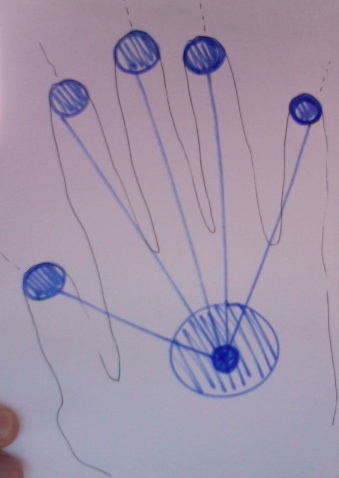 i thought maybe some kind of whole-hand-recognition with an additional tracking point in the palm area ( - saw it on http://multitou.ch , although i can’t find the picture of it anymore; think it looked something like this: *** could be helpful - it would also help to get the orientation for the menu buttons that grow from the user’s fingers. Hmmm....adding a tracker to a palm that was raised off the touch surface may be hard to get working, as you wouldnt want to calibrate the screen to produce blobs when you were not touching the screen. Ive created my 3-finger menu launcher to simply find the incenter of the triangle that is created, which will work for me quite well, since I plan on setting the coordinates of the menu based on that center point. You can easily do your finger launcher thing, though Im thinking that you will have to have it orient depending on what side of the surface you are closet to. This is assuming you are using it in a “table” setup, a “wall” setup would always orient up and down.